This participant sent is a Poinsettia Overlay. 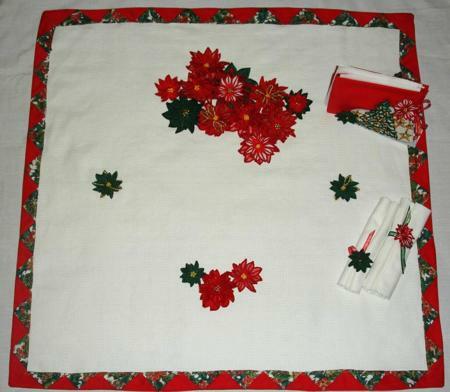 Here is what she writes: "I used Poinsettia Applique Collection and the Christmas Tree Napkin Holder. I did quilting around the edges of the overlay with 2 different coloured fabrics and stitched out the poinsettia's in green and red with a bit of gold, to give it a rich look. 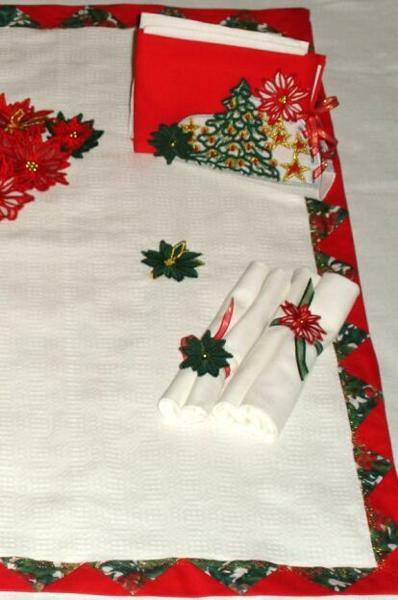 The smaller of the 2 poinsettia I made 25% smaller and added a green and red one to the napkin holder, rolled up fabric napkins and added a green and red one onto green & gold, red & gold ribbon, tied them round the napkins. Then the poinsettias were arranged onto the overlay."